The Skyrim Collector's Edition is filled with dragons and art, so the box was never going to be small. Buying the Collector's Edition of Skyrim will be pretty easy - as long as you remember to pre-order it - but getting it home? That's going to take some planning. 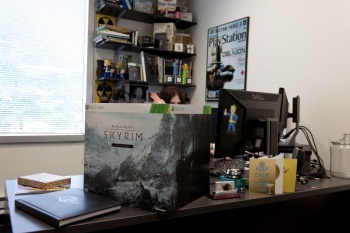 Bethesda has revealed exactly how big the box for the collector's edition is, and as you can see for yourself, it's really not small. Then again, it was never going to be, not if it was going to accommodate everything the Collector's Edition comes with. Inside the box will be a cloth map, a large 200-page art book and twelve-inch tall statue of Alduin, a world-shattering dragon god and the villain of the whole game. It's probably the statue that's taking up all the room, although Bethesda could have arranged the book and map in a very odd way. Of course, the real question is what to do with the box once it's empty. You might use it as a makeshift home for a down-on-his-luck Hobbit, or perhaps as a shelter for a pair of adorable kittens. I suppose you could just put books, or games, or something equally sensible in it, but that just seems like a wasted opportunity. Elder Scrolls V: Skyrim comes out for PC, PS3, and Xbox 360 in November 11th.